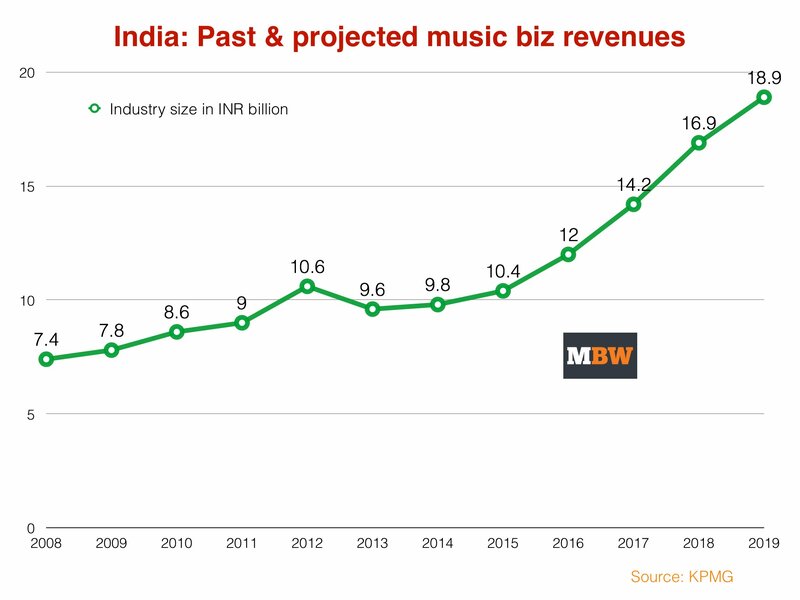 India’s recorded music business will nearly double over the next five years, bringing in an annual income of 18.9bn Indian Rupee (US $300m) in 2019. That’s according to projections from KPMG in a new report based on information from the Indian music business in association with FICCI (the Federation of Indian Chambers of Commerce and Industry). If India achieved this level of growth today, it would be elevated from its current position of 20th in the world’s biggest music markets by value. It would take a comfortable spot in the Top 10, ahead of the likes of South Korea, The Netherlands, Italy, Brazil and Sweden. KPMG’s figures place India’s music industry value for 2014 at 9.8bn Rupees ($155m). That’s higher than the trade value estimate in the IFPI’s Recording Industry in Numbers 2015 – which pins India’s 2014 industry revenues at 6.1bn Rupees ($100m). In fact, the IFPI’s numbers are generally less positive on India as a current legitimate music market. Not only did download revenues decrease 24.8% in India in 2014, but – in a reversal of the business story in most global markets – subscription streaming income for the music business was almost cut in half, down 42% from US $21.4m to $12.3m. There appears to have been at least some migration from these paid-for platforms to free streaming services, which were up 108.1% in value terms in 2014 according to the IFPI, to $22.72m. KPMG’s analysis shows how its version 2014’s cash tally is divided up: 55% from digital music (downloads and streaming), 20% from physical, 10% from public performance and 20% from TV and Radio (also presumably performance royalties, but split out). According to IFPI data, physical made up 31% of total recorded music industry income in India in 2014, with digital making up 58%. The IFPI’s biggest point of difference with KPMG/FICCI is that according to its trade numbers, India’s total recorded music market dropped 10.1% in the year. KPMG estimates that India grew 2.3% in 2014. Either way, KPMG acknowledges that 2014 was “a tough year for the music industry” in India – thanks to a decline of around 30% in physical sales and a similar drop in sales of caller ring back tones. Meanwhile, rampant piracy still reigns. KPMG notes that just 1%-2% of music is consumed by way of legal purchase in India, whereas 99% of the music consumption is still illegal. If just some of this activity could be curtailed in a country of 1.2bn people, reasons KPMG, it could provide a seriously optimistic story for the music business. “With a younger generation that is born in the age of smartphones, and heavily influenced by sources offering pirated content, streaming services should look at ways to catch them young and convert them into paying loyalists,” it writes. Despite the fact that KPMG acknowledges that the main music streaming players in India are “struggling to monetise their offerings” and suffering from “high minimum guarantees from labels”, it believes they can carry India to new heights in the near future. Observes Mandar Thakur, COO of Times Music in India: “The ‘typical Indian mobile consumer’ still consumes mobile telco-based products like ringback tones and hence those products will have a long tail, whilst the ‘evolved modern Indian consumer’ consumes streaming/subscription services, is smartphone-heavy usage savvy and will grow the top end of the market . “In either case – the preference by the emerging consumer is not of ‘ownership’ but of ‘rental’. 2014 saw big players in the streaming space such as Rdio and Guvera launch streaming services in India – the latter confirmed this week that it has attracted 3 million users in the region in less than six months. Meanwhile, telco operators such as Airtel, Vodafone and Idea have launched services to leverage their existing data bundling and billing capabilities. Bharti Airtel, India’s largest telecom operator, launched music app Wynk, which has now crossed more than 5 million downloads, played 100 million songs and been featured in Google Play Store’s ‘Favourite Apps’. Vodafone has also launched its own music streaming service – Vodafone Music, in association with Hungama Digital Media Entertainment. While audio and video streaming are not charged for, the user has to pay nominal fee for downloading content. And Idea launched the Idea MusicHUB, an application that allows subscribers to download unlimited music to their devices, stream songs as per their preference, and also create their own personalised playlists in their preferred language. “The future of the music business is clearly moving towards streaming services,” said Devraj Sanyal Managing Director and CEO, Universal Music Group South Asia. “Players like Hungama, Gaana and Saavn – plus international platforms like Rdio and Guvera who are already here and the certain entry of the other big global players – will decide the quantum of the future freemium and paid user base of music listeners in our region. “With technology evolving at the pace that it is at and the onset of 4G, the stage is now set for a maturity level in music consumption in South Asia.